I have a 16x16 bitmap containing 256 pixels of distinct colours that I want to use as a palette for 8-bit indexed mode. Is there a way to convert this bitmap into one that GIMP can use as a custom palette? I also need the order of the colours to be preserved. Thanks to xenoid's hint, I was able to get this working with a python script. Now the palette is pretty much randomly sorted. If the initial bitmap is sorted on some criteria it is possible to re-sort the palette on the same criteria with a script. A completely different method is to export the image is some easy to process format (possibly text based: C, XMP, HTML) and process that with a script tp generate the Gimp palette (which is ASCII text with a rather trivial format). Editing PNG in GIMP: is it possible to remove lines (used as arrows) and extrapolate the now blank squares? Why can I create layers, but not layer groups in the indexed color mode in gimp? Recolour a higher resolution image, when I have a recoloured lower resolution one? 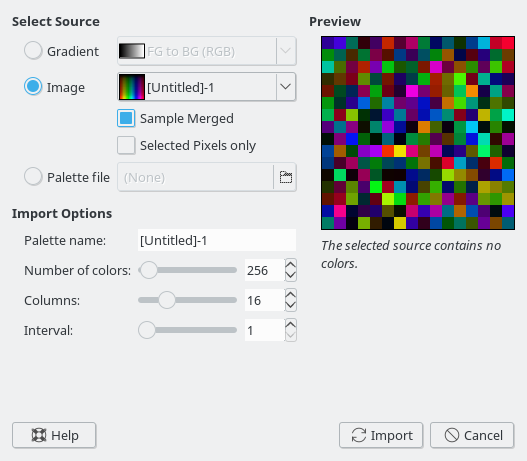 Gimp - How do you specify a maximum number of colors when using a custom palette?